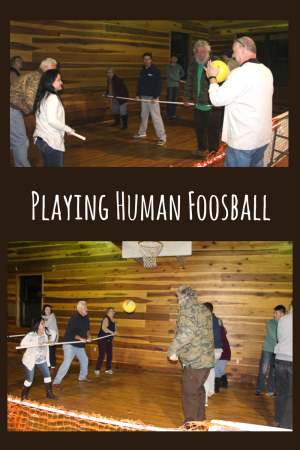 Human Foosball Makes for an Awesome Family Game Night - JP loves LIFE! By this point, I think my family Thanksgivings have become legendary. My extended family gets together every other year and we go big — big fun is a key piece of it every time. 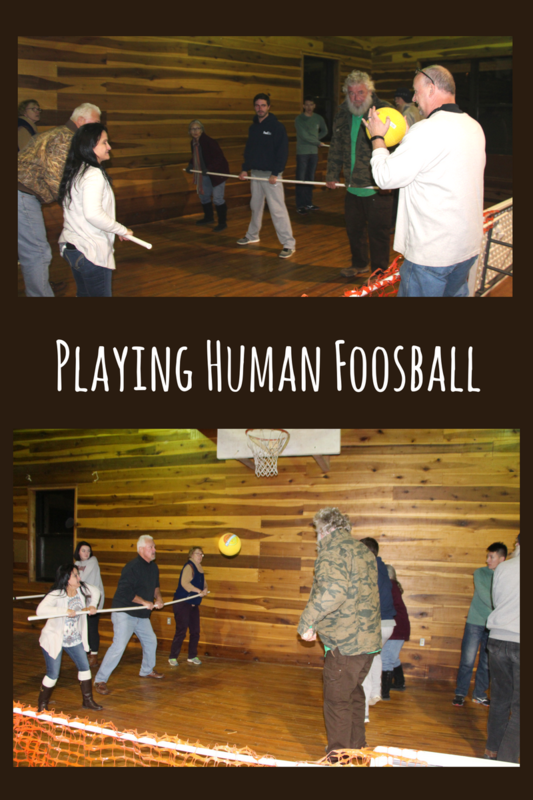 At the last one, we played our first games of human foosball and human hungry hungry hippos. And I have to tell you, the excitement made it hard for me to get video and photos just don’t suffice. I put a bit of it on Instagram, but this year I knew I had to make a point of capturing this so I could relive it. I also thought it would be fun to share. And this also gives my family a way to share it too! We had a large group so we counted off into four teams and had a tournament. Each team is six people and all get plenty of kicking time in. There also may be some fun messing with other players to be had. Each team has a goalie — gotta admit having them with a PVC pipe was only good for making sure they didn’t touch the ball. Otherwise, there were lots of weaponizing it when the goalies were bored. There are two forwards/strikers on each team facing the goalie — good to have folks fast on their feet here! Three midcourt players face off — Lots of fun to be had here too. Use a kickball. The first game or two our first year were played with a soccer ball and I still remember the fear of having a college sophomore kick that ball with all his might in my direction. Get pallets, tables or something to be the side walls. We were lucky to have the rec hall that was so well sized for a lot of it, but last year we had benches for the other side and the ball kept going out. The bounceback is an amazing part of the game. Good shoes make a big difference. We had the court set up & weren’t sure which night we’d play. We decided to go for it and nobody changed shoes. As you can see in the fun times had, some of us could have used a bit more grip. Would your family play something like this? Do you want to see human hungry, hungry hippos? « Holiday Gifts Straight from the Farm!